» Marmot Nanowave 45 Review – A Good Lightweight Sleeping Bag? Marmot Nanowave 45 Review – A Good Lightweight Sleeping Bag? Marmot has a long history of providing excellent quality products for those who like to get outside and explore the elements. The Marmot Nanowave 45 sleeping bag is no exception being a great piece of gear that provides great comfort. This three-season sleeping bag is design with state of the art technology called SpiraFil. SpiraFil is a type of synthetic material insulation that includes a unique blend of large, hollow, spiral fibers and small polyester fibers. Combined, these elements will keep users comfortable, warm and dry in those chilly days. It has been called a “master space saver,” as it takes up very little room when stuffed. 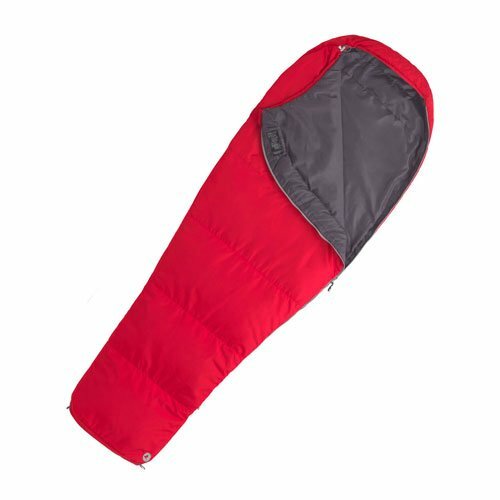 This is a sleeping bag designed for those who prefer packing light in the outer during warmer climates. It is ideal for those going on backpacking, cycling, or camping trips across the globe. The Marmot Nanowave 45 will keep users comfortable during cold weather after a long day exploring. This is a sleeping bag that won’t drag you down. It will power you up by providing you an excellent sleep, preparing you for a new day of exploration and discovery. You can’t beat quality like that. Designed with compressibility and warmth in mind, the Marmot Nanowave 45 sleeping bag is an excellent example of a high quality product at a great price (For the latest prices and discounts, check here). Created with cycling and kayaking trips in mind, Marmot strived to make a sleeping bag that was compact, light and durable enough to withstand the sometimes harsh outdoors. The Marmot Nanowave 45 sleeping bag is the result of those ideas. This is a sleeping bag with a plethora of great features that have been custom designed to meet Marmot’s goal. The DWR treated polyester taffeta fabric sheds moisture, instead of absorbing it. This keeps users dry in damp conditions. This does not mean that the Marmot Nanowave 45 is waterproof. If it gets soaked in a rainstorm, it will remain that way until it dries out. It is merely water resistant. Additionally, this mummy style sleeping bag captures and contains body heat. It has easy to reach draw cords and an excellent zipper guard. While the compressibility of this sleeping bag might be its most impressive feature, it was also designed with comfort and warmth in mind. Available in two sizes, regular (up to 6ft) and long (up to 6.6ft), the Marmot Nanowave appeals to people off all heights. The only real design flaw is that the sleeping bag itself is rather narrow. Users with broad shoulders or wider builds have complained that the sleeping bag is way too tight, and therefore, uncomfortable. If you can, test it out before you buy. However, if you don’t have a wide build, you will probably be fine. The Marmot Nanowave 45 sleeping bag rates very high on the comfort scale. The synthetic insulation is both warm and soft, offering excellent padding for users. The mummy style construction of the bag is designed to retain heat, even in cooler situations. Many users have called the Marmot Nanowave 45 a “very soft bag,” applauding the comfort and design of this sleeping bag. Zipped up and bundled in, you are sure to be comfortable, dry and warm! Compressibility is easily the most impressive feature of the Marmot Nanowave 45 (link to website). This is a synthetic sleeping bag that will not take up a lot of room when stuffed. It packs down to the size of a football! Is that hard to believe or what? However, keep in mind that this is a sleeping bag that is meant to be stuffed and not rolled. If you attempt to roll it and then pack it away, the Marmot Nanowave 45 sleeping bag will take up quite a bit of room. So, stuff it and you’re golden! It is also important to note that the Marmot Nanowave 45 sleeping bag will compress more easily outside of its stuff sack. This is actually ideal as many customers have complained that the stuff sack is too small, making it nearly impossible to get the sleeping bag back in after being removed for the first time. Personally, I rarely use a stuff sack as I find I can compress sleeping bags more easily outside of them, but the choice is yours. The Marmot Nanowave 45 sleeping bag does not come with a loose fitting storage sack. The Marmot Nanowave 45 sleeping bag is advertised as a three-season product. Designed with this in mind, this mummy style sleeping bag is meant to retain heat, when full zipped up. It does, to an extent. This is only one of the claims that challenge Marmot’s three-season guarantee. Marmot claims that this is a 45°F (or 7°C) sleeping bag, with a comfort rating of 56°F (or 13°C). This claim has gone under speculation by those who have purchased the Marmot Nanowave 45 sleeping bag. Some have said that this temperature rating is optimistic at best and highly inaccurate. These customers have stated that the sleeping bag did not retain heat well in cooler conditions, leaving them cold. However, others have raved about the temperature rating, claiming to have used to bag in conditions colder than 45°F. It’s a difficult call to make. Some call the Marmot Nanowave 45 an excellent three-season sleeping bag, while others maintain that it is strictly for warmer weather. It varies from user to user. The only way to discover the truth is to understand your sleeping needs and test out the bag yourself. My guess would be that cold sleepers will find that the Marmot Nanowave 45 is not warm enough for them in cooler conditions. The Marmot Nanowave 45 is a high-quality synthetic sleeping bag that functions best in warmer climates. This is a product that is extremely durable. The construction of the sleeping bag was designed in order to outlast wear and tear, creating a product that will last users many seasons to come. That quality, combined with excellent compressibility and weight, will provide users with an excellent sleeping bag. The Marmot Nanowave 45 is an excellent sleeping bag designed with kayaking and cycling in mind. They wanted to create a sleeping bag that was compact, light, and comfortable. This is a feat in which they succeeded. While there has been a lot of speculation regarding the warmth, it’s difficult to judge which side is more accurate. Is it a three-season bag or not? To be safe, I would say that the Marmot Nanowave 45 is excellent for travelers who want to pack light during the summer months. This is a sleeping bag that will keep you warm, dry, and comfortable. Concerning cooler temperatures, the verdict is still out. You will have to make the call yourself.